Modern Solo Classical Guitar Music. All instrumental compositions are written by Jamie Palumbo, please check out Jamie's rock music, also on CDBaby. Also, go to www. jamiepalumbo.com to see photos and learn more about the artist. 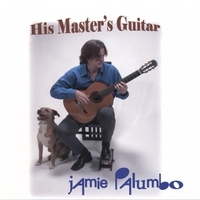 Jamie Palumbo is a rock guitarist that also plays classical guitar and has done so ever since he was a young lad. All tracks are instrumental and offer up as soothing flavor of guitar dreamscapes that transports the listener to a variety of beautiful places.